Abi Elphinstone grew up in Scotland where she spent most of her childhood building dens, hiding in tree houses and running wild across highland glens. After being coaxed out of her tree house, she studied English at Bristol University and then worked as a teacher in Africa, Berkshire and London. When she’s not writing, Abi volunteers for Beanstalk, teaches creative writing workshops in schools and travels the world looking for her next story. Her latest adventure involved living with the Kazakh Eagle Hunters in Mongolia. 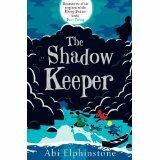 Find her on Twitter at @moontrug and on her website. 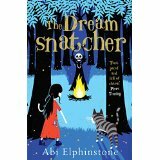 The Dream-Snatcher (sequel The Shadow Keeper): Twelve-year-old Molly Pecksniff wakes one night in the middle of the forest, lured there by a recurring nightmare – the one with the drums and the rattles and the masks. The Dreamsnatcher is waiting. He has already taken her dreams and now he wants her life. Because Moll is more important than she knows…The Oracle Bones foretold that she and Gryff, a wildcat that has always been by her side, are the only ones who can fight back against the Dreamsnatcher’s dark magic. Suddenly everything is at stake, and Moll is drawn into a world full of secrets, magic and adventure.